My eyes widened with surprise. ‘They have an english name?! Really? Oh wow’. 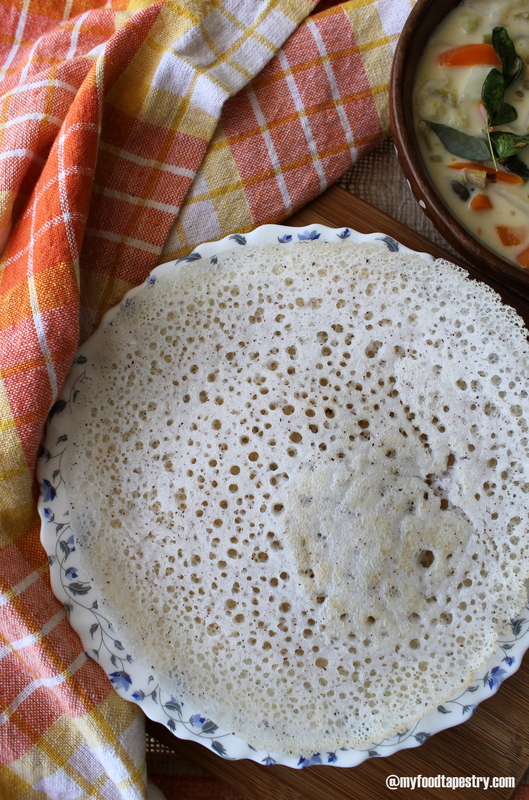 Lacy Hoppers is the anglicized name given to these lacy soft delicious pancakes made with rice and coconut milk. A speciality of a state tucked away in the south west corner of India. Kerala. Kerala, commonly referred to as ‘God’s own Country’ is dotted with majestic hills, serene backwaters and palm fringed beaches. Along with its incredible beauty, highest literacy in a state, the place boasts of many gastronomical surprises. Kerala cuisine has a multitude of both vegetarian and non-vegetarian dishes prepared using fish, poultry and red meat. Since coconuts grow in abundance, the keralites use them in and on everything. Literally. 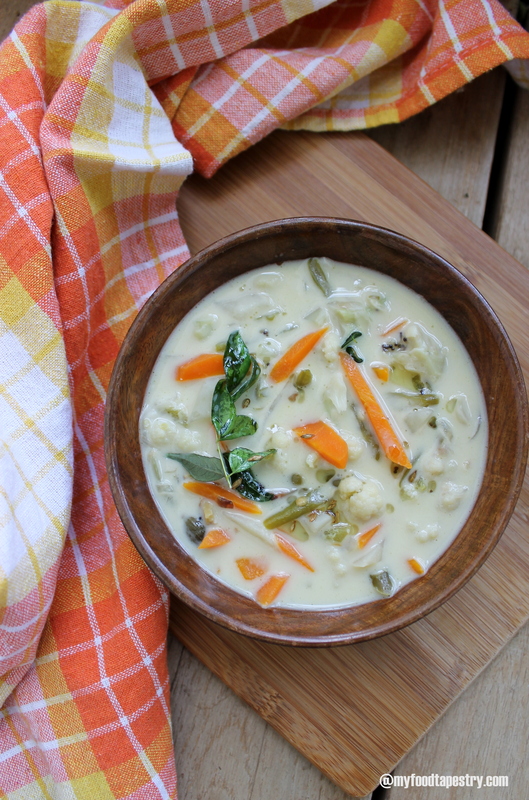 A thin vegetable stew simmered in coconut milk, flavored with whole spices like cinnamon and bay leaf and garnished with a tempering of curry leaves. Sounds good? Yes, even better with soft lacy pancakes. I used to make them so often earlier. And then in between I just stopped. I don’t know why. Maybe we got bored and then I simply forgot about them. Well, the husband reminded me and out came the aching desire to eat these hoppers with a runny stew. 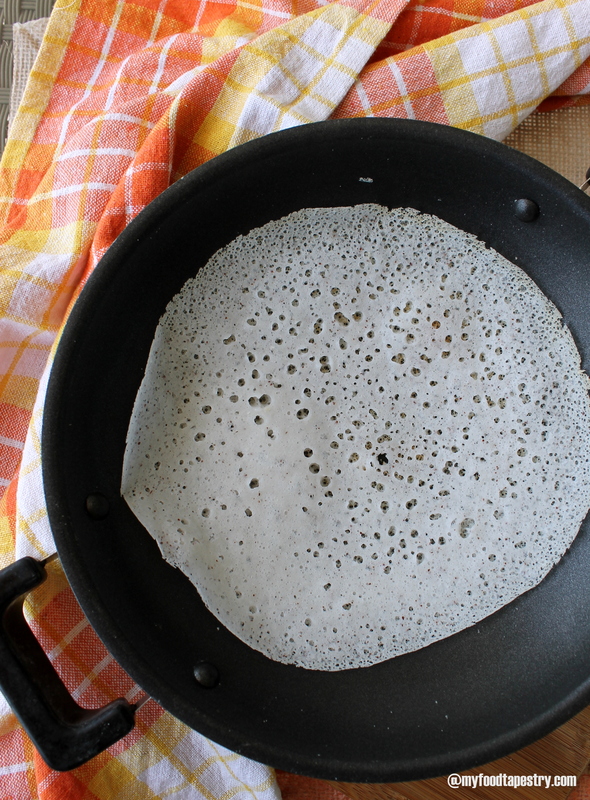 Appams are bowl-shaped thin pancakes made from fermented rice flour. They take their shape from the small Appachatti in which they are cooked. They are fairly neutral in taste and mostly served with some spicy condiment or curry. These hoppers are made from a batter using rice, yeast, salt and a little sugar. After the mixture has stood for a couple of hours, it can be fried in the appachatti with a little oil. It is mostly served with Kadala (Chickpea) curry, mutton or vegetable stew or egg roast. 1 cup uncooked rice, soaked. I used normal kolam rice. coconut water to grind, optional. little oil to make the appams. Soak the rice for at least 3/4 hours. Grind the soaked rice, cooked rice and coconut using coconut water to a smooth paste. Add salt and sugar. Let it stand for at least 6 hours. Before using the batter, add baking soda. Mix well. Now heat an appa chatti or a you can use any non stick small wok. Add just nne drop of oil to ensure that the batter doesn’t stick. Now drop a ladlefull of batter. Pick up the appa chatti in your hands, twirl it, so that the batter forms a lace around the middle portion. Place back on flame, cover and cook for 3 to 4 minutes or till the sides start to leave the pan. 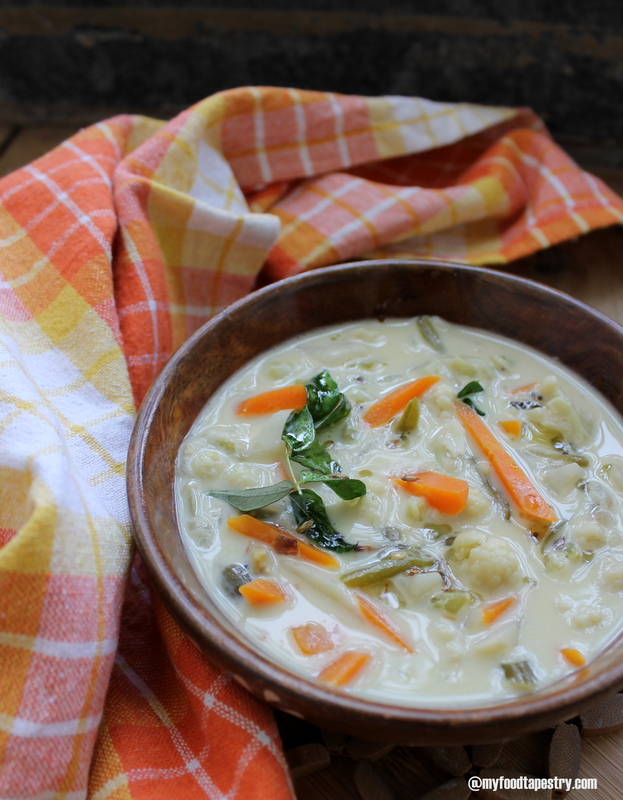 Serve with any curry, or stew or any non vegetarian curry of your choice. Note: The batter though fermented is not one bit sour. Maybe because of the natural mild sweetness from the coconuts and the addition of 1/4 tsp of sugar. 1 cup assorted vegetables, I used carrots, beans, cauliflower, potatoes, peas and capsicum – chopped. 2 cups coconut milk, I used store brought. Tempering: 1 tsp oil, 1/2 tsp mustard seeds and few sprigs of curry leaves. In a pot, heat coconut oil. Saute the whole spices till fragrant. Now add the ginger garlic, green chilies and onions. Saute till they just turn pink. Add all the chopped vegetables, along with salt. Pour half the coconut milk along with 1/4 cup water. Mix, cover and let it simmer till the vegetables are almost done. Now stir in the rest of the coconut milk and let it boil for a minute or two. Make a tempering of oil, mustard seeds and curry leaves. Pour over the stew. 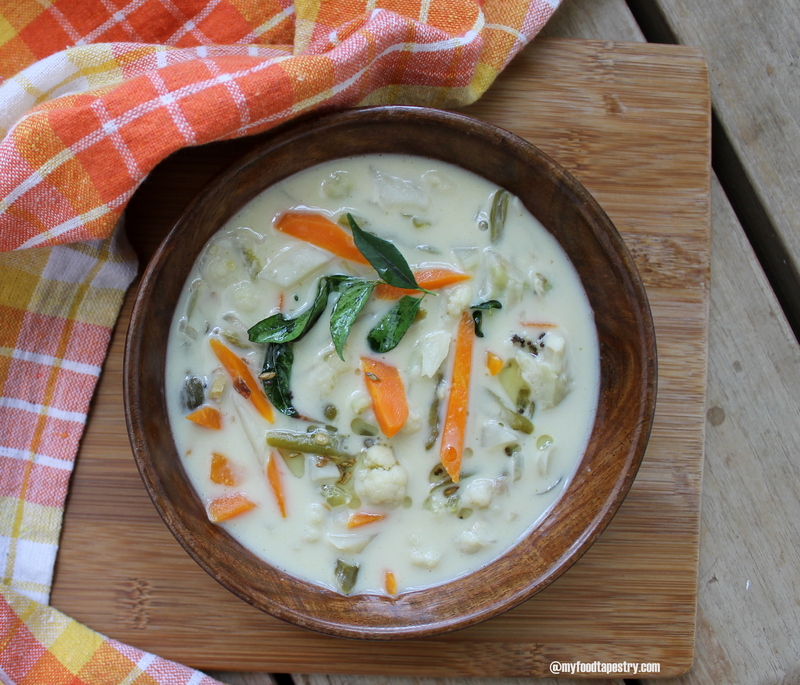 Serve hot with appams or plain rice or dosas. 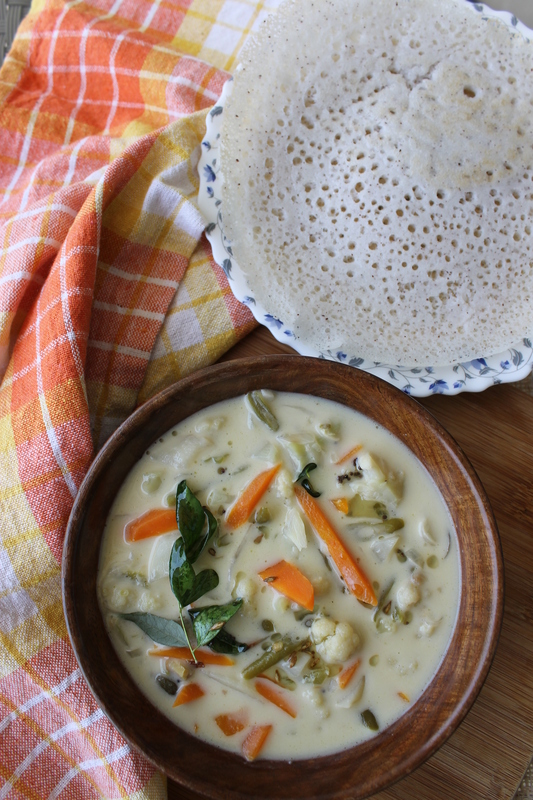 Note: Since coconut milk is used generously, the stew needs to be spiced in order to be enjoyed with lacy appams. So I would suggest up the heat from the green chilies and peppers according to your taste.